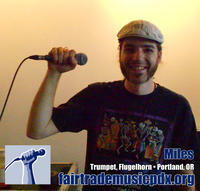 Fair Trade Music is an initiative for musicians, by musicians. A list of Important terms, conveniently arranged alphabetically, from "Amateur" to "Zero Guarantee"
Endorsers are those who have pledged to help spread the word about Fair Trade Music. These are suggestions on how to do that most effectively. If you haven't already, endorse now! regardless of their geographical location.